It's Time to Call GuardDog NOW! Early in 2009 an independent pit owner contacted us indicating he’d heard about our systems and was interested in installing video surveillance at his aggregate pit-mining operation. At the time, we were unaware that video surveillance had a place in a quarry; So curiously, we accepted the gent's invitation and met with the owner. Upon inspection of his remote, rural scale installation, we concluded the surveillance installation would be simple. Recognizing the potential, we suggested to the customer if you're willing to "work with us," we may be able to, with a little innovation, integrate his digital scale system with our digital video system and for virtually no additional cost, provide a whole lot more VALUE. The gent was more than willing and over a short development program we succeeded! Not only did we provide our customer exceptional video surveillance (that provides him record of all that enters/exits his pit) our integration of his scale system also provided him a whole lot more. Our initial customer reports that his investment was paid for (100%) after only five (5) months of operation – just from revenues he was being shorted - the difference between what actually crossed and what was reported (by the truck operators) that crossed the scale. Additionally, he’s also recovered what others stole (drove out without crossing the scale) and identified those who were trespassing his site. This client was so pleased with the results from our systems that he provided referrals that sold an additional five (5) systems! Since that initial installation we’ve successfully integrated scales from a number of different companies and installed our products in applications varying from pit mining operations, to agricultural applications to recycling businesses. Our base system consists of a complete video surveillance system with 3 high resolution color (with night vision infrared) cameras. The cameras are typically positioned to capture incoming/exiting traffic (before the scale-house), the scale and incoming/exiting traffic into the pit (beyond the scale-house). This provides a complete record of all entrance and exit traffic. GuardDog Surveillance Systems's integrated scale-video system captures your scale data and superimposes it onto the video image from the scale camera. At the same time, we create a Microsoft Access Database from which our “Smart TEXT Search” feature locates all scale transactions over a given time period. When “Smart Search” is selected, the result (complete with the superimposed scale data) is a chronological listing of the scale history. When a text string is selected (clicked on) an image associated with that scale record appears. From there, a video clip (or a still image) can be reviewed on the spot or saved to disk (or a thumb drive). simple totals, sorted by customer for invoicing or used to quickly compare daily load ticket reports against what actually crossed your scale. The above graphic details a recently completed scale integration project that was a collaborative effort between GuardDog Surveillance Systems and an exceptionally talented scale sales, service and calibration firm that we partnered with. Problem Statement - Client staff was required to walk (~400’) from “B” to “A” in order to “scale-in or scale-out” trucks coming or going from facility. Improve time, reduce ongoing operational cost and maximize convenience are all the operative descriptions of this project’s underlying scope. 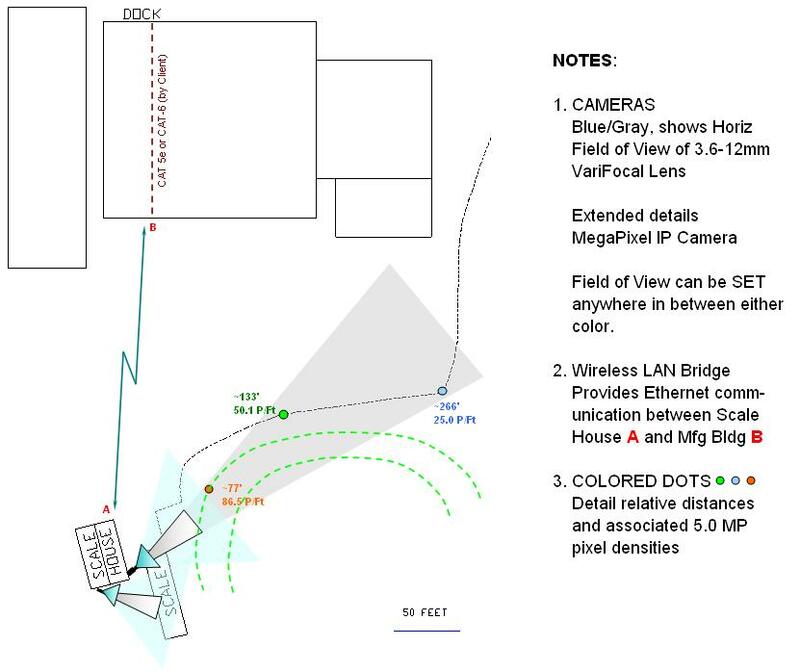 The noted 5.0 Mega-Pixel IP camera was a project “add-on” that was implemented mid-project when it was discovered that thieves had climbed the fence (dotted line on the layout) and stolen raw material. The addition of this camera provides license plate identification (day or night) of a vehicle located anywhere within the intersection or the green dotted lines (driveway) and the grey camera extension. Our completed project – which included all material, integration, custom software, training and remote client support – completely met all customer objectives and is functioning flawlessly. It is very likely that you don’t have applications that even begin to approach the complexity of this project’s scope. That’s fine. If we can do the complex – which this project fully demonstrates – perhaps it’s time to contemplate the value we might add to your operations. To inquire about your application or for additional information select CONTACT US below.